Point2CAD is an indispensable software for intuitively reverse-engineer physical parts into SolidWorks CAD environment. With Point2CAD you can easily create parametric solid models from your physical part. Using an arm is like using your mouse, but with the added ability to capture data live in 3D. Define coordinate systems, probe features such as circles, slots and much more to generate the ideal model. You can even check your work or get guidance for defining tolerance, by probing over the part using the deviation check function. Sketch Entities - Sketch lines, circles, ellipses, splines, slots, planes and other elements with your measuring arm. AutoSketch – Quickly sketch profile perimeters. Command Plate - Work faster without a mouse or keyboard. 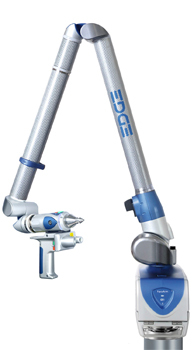 Leapfrog – Reposition the measuring arm around larger parts. Deviations - Inspect and compare the part to the parametric model. 3D Circle - Capture precise circles within a 3D sketch. Cross Section Acquisition Mode - No longer limited to splines, the Cross Section Acquisition Mode permits probing lines, arcs, and other geometric entities. Countersunk Hole - Create holes with draft angles. Ellipses - Generate ellipses with major and minor axes. Parallel (Offset) Planes - Quickly generate planes parallel to existing planes. Probe Compensation: Smart Tip and Last Point Compensation - Automatically offset sketch entities based on the probe tip’s orientation or position. Last-Point Compensation - A more direct way to specify compensation direction for sketches. All you have to do is to hold the probe outside of the feature when creating the sketch. Measurement Functions - With ten different measurement tools your CMM becomes a versatile caliper / protractor. REGISTER AND DOWNLOAD YOUR TRIAL VERSION TODAY! You have purchased license after Feb 8. 2014. Just download the 2.2 installer, install the application and update the license in Point2CAD. You have purchased license before Feb 8. 2014 and your one-year of Maintenance & Support period is over. Please contact your reseller for more information. Check your current license status in the License Manager. Register or login at the top of this page. Go to 'Downloads' and follow the instructions. 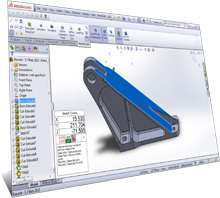 Start SolidWorks and request a trial license in the add-in. Read the User Manual and watch the video tutorials to learn Point2CAD.